One Nepali migrant worker a day dies in Malaysia - Integration Through Media ....! Narayan Adhikari, MALAYSIA: One Nepali migrant worker a day dies in Malaysia, according to statistics provided by the Embassy of Nepal in Malaysia. It is said the casualties are due to suicide, road accidents, industril accidents and serious diseases. As per the data provided by the Embassy of Nepal in Malaysia, 322 Nepali migrant workers have died so far in 2018 due to various causes. This figure was 364 in 2017. Nepal’s Charge d’ Affaires at the Embassy, Kumar Raj Kharel said among the casualties in 2018, the highest number, 43, was from suicide followed by 39 due to serious diseases, 25 in road accidents and 17 in factory accidents. Similarly, the number of people killed due to drinking excessive liquor, fighting and other reasons was 198. Among the dead, one is a woman whereas the rest are male. Among the Nepali migrant workers who died in Malaysia in 2017, sixty five had committed suicide, 63 died from serious ailments, 27 died in road accidents and 14 died in industrial mishaps. The casualty figure due to other reasons than the reasons mentioned before was 195. Charge d’ Affaires Kharel said the Nepali migrant workers die mainly due to tuberculosis, liver ailment, dengue, brain hemorrhage, appendicitis, meningitis, and others. As he said a good number of Nepali migrant workers also die due to train-hit, falling from moving bus, electrocution, murder, asphyxiation, chest infection, falling from terrace of tall buildings. Latest statistics shows that there are 383 thousand Nepali migrant workers in Malaysia. Kharel estimates that the number of those working illegally after running out of their visa term is around 100 thousand. Of late Nepali workers have been unable to come to Malaysia as the bilateral labour agreement remains unimplemented. Due to this, the number of Nepali workers in Malaysia has declined. Prior to this, around 700 thousand Nepali workers were in Malaysia, report showed. 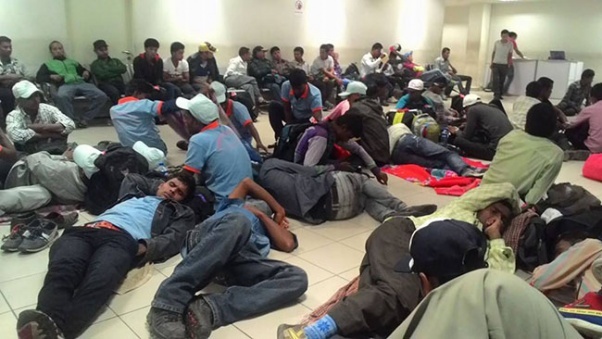 According to Charge d Affaires Kharel, Nepali migrant workers suffered untimely deaths due to lack of required skills for work, and inhospitable situation of Malaysia. Knowledge and awareness about its situation, law and language are essential for any Nepali arriving here as a worker, he asserted. According to him, the Embassy received around 200 complaints orally and in writing from migrant workers. Most of them verbally apprised the Embassy and people concerned about adversities they are facing here. Complaints are largely about nonpayment, underpayment and different nature of work as promised in the contract paper. When such unexpected adversities became unresisting for them, they aspire to return home and if not possible, in some cases, they chose to commit suicides. Embassy Public Relations Officer Rabi Bhatta said it encounters with difficulty to even collect the body after death. In case of the deaths of those residing here illegally, families are contacted before sending the bodies home. In case of poor families, the Embassy itself bears the transport fare while in case of those working legally, the hiring company itself bears the cost for the transport of mortal bodies.